Light installations in Southall, digital art for Hackney youngsters and creating Camden’s answer to the New York Highline public park are among 25 community-led projects the Mayor of London has pledged to support through his Crowdfund London initiative. Sadiq has pledged up to £40,000 to each of the projects, which have been selected from nearly 80 ideas from community groups who want to regenerate their local areas. 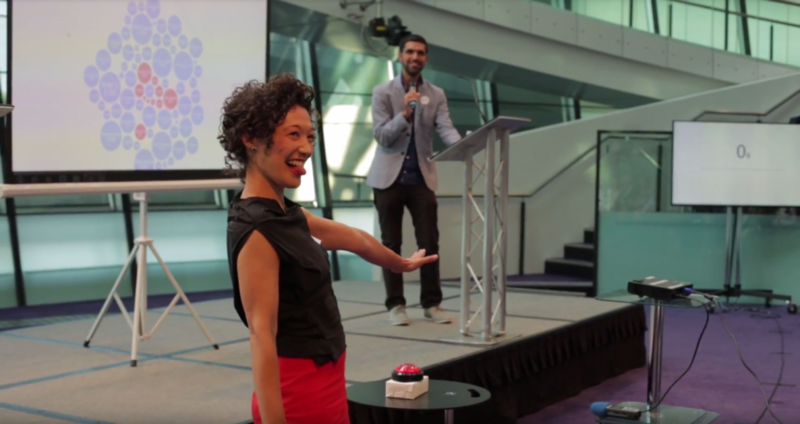 Last night they drummed up further support at a live ‘pitch and pledge’ event at City Hall, attracting hundreds of pledges from a diverse mix of businesses, foundations, boroughs, and individuals. 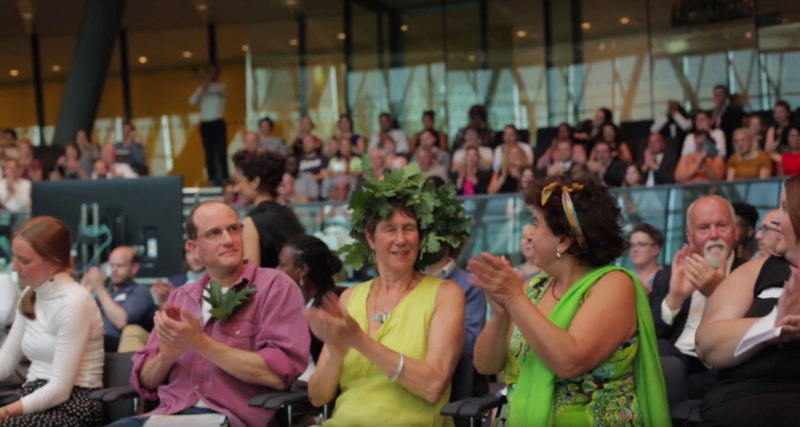 This ground-breaking programme, run in partnership with London-based civic crowdfunding website Spacehive and backed by the London Economic Action Partnership (LEAP), invites communities to come together and propose ideas to regenerate their local areas, with the support of City Hall, local residents and beyond. Each project had just two minutes to sell their idea, what its impact would be and why it was important, before pressing our giant red button to find out the size of the pledge that they would receive from the Mayor of London along with other funders in the room including Esmee Fairbairn Foundatin. With Sadiq Khan, the Mayor of London, stating “Crowdfund London represents a pioneering way for Londoners to drive regeneration of their local area from the grass roots up. It is inspiring a new generation of civic leaders and helping them unlock creative and innovative ideas for their communities. After receiving a pledge from the Mayor the projects now have less than two months to complete their campaigns and since crowdfunding is an ‘all or nothing’ model these projects now need YOU to help make them happen. Last night alone we had 250 individuals, businesses, councils charities and foundations in the audience come together to contribute £91,117 towards the projects targets highlighting the amazing catalytic effect of the Mayor’s pledge. Backers included renewal energy company Bulb, creative co-working space Second Home, Ladbrokes and B&Q alongside Esmee Fairbairn Foundation, Growing a Greener Britain and Veolia. Chris Gourlay Founder and CEO of Spacehive said “We are delighted to be working in partnership with the Mayor of London on this award-winning initiative which has already inspired thousands of Londoners to engage in transforming local places. “Our shared mission is to empower as many people as possible to shape their city. We believe that if we can achieve that, people will feel a stronger sense of local belonging, and that the places we create together will better serve the needs and aspirations of Londoners. Building on momentum at the 77 Atlantic Road DIY community space by refitting the kitchen, to better deliver events and workshops as part of a more accessible hub for local people. Will also trial an electronic upgrade to the local Brixton pound currency. Learn more and pledge here. Engaging the local community to co-produce a feasibility study for two new community spaces at the heart of Elephant and Castle. It is proposed that underused parking garages, blighted by anti-social behaviour, be transformed into a neighbourhood hub for both work and play. Learn more and pledge here. Feasibility work to explore the transformation of a disused railway into a public park and pedestrian green link between Kings Cross and Camden Town. Learn more and pledge here. Local film set company using their expertise and experience to bring a derelict space back to life for the whole community as a community hub that provides benefits for local people including ad hoc flexible workspace to local creatives, open-air film screenings, an outdoor space for market stalls, a skate park, apprenticeships and educational partnerships. Learn more and pledge here. Community Land Trust – Royal Urban Synthesis Society (RUSS) – intend to self-build a local community space to bring the new and existing community together as they build a housing scheme. The space will double as a knowledge hub to share the experience of self-building and inspire other communities to consider this innovative model of developing local responses to affordable housing provision. Learn more and pledge here. Local people in Barking and Dagenham will come together to curate an outstanding light festival alongside internationally renowned arts production company. The festival will be locally affordable and provide a world class experience in outer London. The process will provide learning and employment opportunities for the local community. Learn more and pledge here. Light installations will create a stunning arts trail across Southall to celebrate its cultural diversity and local heritage, whilst supporting the night-time economy. Learn more and pledge here. Creating a new multi-purpose community hub and café by refurbishing a disused bowling club building. The space will allow for flexible activities with the aim of connecting people and reducing social isolation by delivering new skills for life and employment alongside food growing. Learn more and pledge here. Phase 1 of an ambitious project to create a new library and community hub in the ground floor of a new housing development. The first phase will fit-out the empty shell to create a space that meets the needs of a modern, multi-purpose library and allow the group to make crucial progress on a longer journey. Learn more and pledge here. The external refurbishment of an iconic and much loved local art deco cinema. The project will also create a second screen allowing form more local events and the sustainable operation of this non-profit community facility. Learn more and pledge here. A project to explore a forgotten park’s incredible history and invite the local community to be a part of its future. A community led, co-design process will explore future plans through trials and meanwhile uses ahead of a more permanent proposal for a new public green space. Learn more and pledge here. Building a sustainable food yard, kitchen and event space to acts as a hub for the promotion of sustainable food activity in London. Affordable space for food start-ups will sit alongside a food lab co-designed with the community. The project will provide education, outreach and advocacy for innovation in sustainable food practices. Learn more and pledge here. A project to launch a suburban farming project and realise the potential to generate food for the local area. The abandoned Tolworth Allotments Society building and surrounding land will be used to introduce the community to suburban farming possibilities, teaching food growing, and building productive, sustainable sources of locally produced food. Learn more and pledge here. ‘Shine Cafe’ will be a new coffee shop and social enterprise in the heart of Haringey. Providing training and income for at-risk locals, the new cafe will be a hub for the Turnpike Lane community and will support people experiencing issues with homelessness, drugs and alcohol, providing space for wellbeing activities, an art studio and exhibition space, and where people test business ideas and develop their skills. Learn more and pledge here. Historic Chalton St market serves a diverse community in Somers Town, set amidst significant local development and regeneration around Kings Cross and Euston. This project will improve legibility and the market environment, aiming to build a stronger intergenerational economic and social hub for the area so that it can support community resilience and help local people secure nearby opportunities. Learn more and pledge here. The Library of Things in the vibrant library space in Crystal Palace will be owned by the Library hub and offered at low cost to people who want to borrow useful items. The idea will inspire and support people in the local community to spend less, waste less and share more. The Crystal Palace Library of Things will help to build a powerful sharing economy and facilitate knowledge and skills sharing. Learn more and pledge here. A derelict site will be transformed into a farm project creating an orchard, vineyard and bee aviary. The Horsenden Allotments Association will bring together active associations, allotments, schools, other community groups to co-deliver this project. Learn more and pledge here. This project will introduce a new market for the post-school, pre-evening time. It will offer stalls for young people wishing to sell and a sound stage for young people wanting to showcase their ideas to a live audience. The project aims to bring young and older people together in the heart of the town, creating new civic intergenerational exchange. Learn more and pledge here. A project to transform a car park into a beautiful garden and art studio for people with a learning disability. It will be maintained and used by local people who are supported by the Camden Society to learn new skills. The new space will replace the existing centre and provide a social hub, and learning space to around daily users. Learn more and pledge here. Newington Library, currently vacant due to a fire in the neighbouring Town Hall in 2013, will be re-energised with a new community space and gallery that will host public art courses, talks, exhibitions and events which will inspire and harness the creativity in the local community. Learn more and pledge here. This project proposes the creation of a new ‘village garden’ for Rayner’s Lane with improved public realm and a small structure to facilitate community events. It will be a catalyst for wider improvements within the area and to galvanise the local community. Learn more and pledge here. A peace-themed musical score and a large-scale community performance in Croydon to commemorate WWI as well as more recent events will aim to inspire young people and the local diverse population. The project will also create school education packs to provide a legacy and the score adapted to different musical styles to achieve broad outreach. Learn more and pledge here. The fit out of rooms at Hoxton Hall with digital art and recording facilities will create a new space where young people can explore and learn new creative skills in web design, music production and more. Learn more and pledge here. The transformation of a series of underused garages in East London in to an ‘eco’ Makerspace – a creative hub where the local community will be trained in the production and selling of high quality environmentally friendly products made from waste as well as sustainable business models for entry-level micro SMEs. Learn more and pledge here. A project to fund the creation and installation of sculpture in a number of sites around Furzedown high street, all created from a felled local tree. The various sculptures, once installed, will form a trail for the local community and visitors to enjoy. Learn more and pledge here.